I RECENTLY embarked on a burger hunt to find the best street burger in Kuala Lumpur and the nearby areas. Each weekend, I would visit a popular burger stall in search of the ultimate burger. After a month of burger hunting during which I became a couple of pounds heavier I reached my verdict. Taking the first place is the ultimate, mind-blowing OM Burger from Ampang Jaya (in front of the 7-Eleven outlet). I have been coming here for my burger fix ever since Rif introduced it to me six years ago! The pakcik has been running this stall at the same spot for 24 years. He operates from 8pm to 5am (the opening hours are not fixed) daily. Juicy and full-flavoured: Burger Shop’s offering was really difficult to take a bite of without all the sauces oozing out and the patties sliding out from the burger bun. I went there with Rif and my best friend Jeen at 11.30pm on a Saturday night, and there were quite a few people waiting for their share of greasy goodness. We quickly placed our orders, and while waiting, I chatted with the pakcik and asked him a few questions about his burgers. He uses quality ingredients, especially the butter and mayonnaise. Quality, he said, was the key factor in making a really good burger. He also uses Kraft cheese for his burgers and he sells an average of 300 burgers a day! This monstrous assemblage of patty, egg, cheese, onions, shredded cabbage, mayonnaise, chilli sauce and crisp buttered buns was unrivalled in this burger hunt. This is by far the sloppiest, most gratifying street burger I have had! I had trouble taking a bite without everything smearing the sides of my mouth, and even my nose. Not that it mattered; I was too busy enjoying every bite to worry about how I looked! 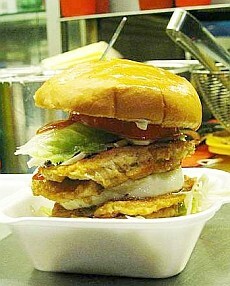 The OM Burger stall is located in front of the 7-Eleven outlet in Lorong Kolam Air Lama 1, Ampang, Kuala Lumpur. The Brother John Burger in Damansara Utama comes in second. Abang John has been manning his stall for 10 years and sells more than 200 burgers (including hot dogs) a day. He opens for business at 8.30pm and closes at 3am. At 11.30pm, there was a queue (most of them his regulars) and we had to wait 30 minutes for our burgers. Abang John was very friendly and happily answered all my questions. The patties are “butterflied” (split into half before they are cooked, so each looks like a butterfly – hence the term), and he adds a dash of chilli powder, pepper and a squeeze of mustard before putting the patties back together. 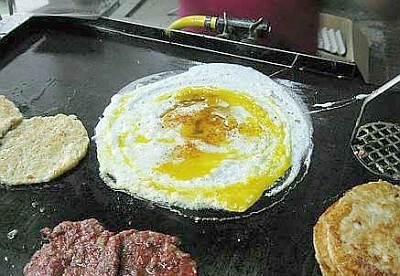 The egg is swirled on the pan, forming a crepe-like base. When the egg is about to set, chilli powder, pepper and soy sauce are added for flavour. The seasoned patty is then placed on top of the egg base and topped with a slice of cheese. Abang John folds the egg very neatly to seal in the flavours. The slightly crisp bun base is first topped with shredded cucumber, lettuce, tomato slices and chopped onion, followed with a generous squeeze of mayonnaise and BBQ sauce. Sealing in the flavour: The Brother John burger being egg-wrapped. The extravagant patty is then placed on top and drizzled again with mayonnaise and BBQ sauce, and covered with the bun top. Watching him prepare the burgers made me salivate in anticipation. Once my Ayam Special was ready, I proceeded to eat it with gusto. Each bite was sublime. The egg-wrapped patty oozed melted cheese and the mustard gave a sweetish tang to the meat patty. Absolutely lip-smacking with the BBQ-mayo sauce combination! Abang John’s burgers are less greasy because he uses shortening instead of butter. Nonetheless, it is every bit sloppy and delicious, just the way a good Ramli burger should be. Brother John Burger is located across the Uptown Hawker Centre, outside Restoran Kopitiam Bintang (next to CIMB Wealth Advisors). Coming in third is the Otai Burger at The Burger Shop in SS15, Subang Jaya, recommended by Rif’s colleague who used to study in the area. At 1.30am, there was a long queue and I had to wait for 30 minutes for my burger. Greedy me ordered the Double Cheese Chicken Special while Rif had the Special Chicken Burger. Basically, mine was double his. Like the Brother John Burger, the patty is “butterflied” and placed on the grill. The patty is not pressed; instead, it is singed on the outside and constantly stabbed to allow the inside to cook without relieving the patty of its glorious juices. Only lettuce is used for the garnishing. Juicy and full-flavoured, my burger was loaded with lettuce, tomato, two slices of cheese, an egg, a generous slather of mayonnaise and chilli sauce. It was really difficult for me to take a bite without all the sauces oozing out and the patties sliding out from the burger bun! The Burger Shop is located opposite the MPSJ market, near Asia Cafe, in SS15, Subang Jaya. 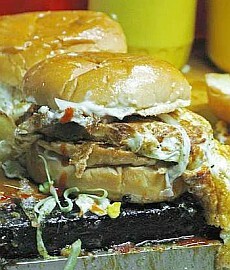 Clinching the fourth spot is the Ramly Burger at Petaling Jaya’s SS2 Mamak Square. My colleague Shum has been patronising this stall for more than a decade. Wan, the friendly burger chap, sportingly answered all my questions. While he uses local chilli sauce (Puteri) for the burgers, the mayonnaise and cheese are imported. On a good day, he sells between 100 and 150 burgers. Jeen had the Beef Special Cheese and Rif, the Ayam Special Cheese (RM4 each). For the sake of blogging (my favourite cover line when I am plain greedy), I went for the Ayam Double Special Cheese (RM5). It has two chicken patties, a slice of cheese, a sunny-side up, shredded onion and cabbage, mayo and chilli sauce. Rif and Jeen’s version had one patty each. Simply the best in town: OM Burger. For my burger, the patty was fried in butter and a sunny-side up was made separately. The burger was then assembled in this manner: Bun base+mayo +chilli sauce+chicken patty 1+sunny-side up+cheese slice+chicken patty 2+ chilli sauce+shredded vegetables+ bun top. Massive, I know! Again, it was hard to put the whole thing into my mouth. Taste wise, it was better than average, but nothing spectacular. I would have preferred the egg to be wrapped around the patty, or at least one of them. The sunny-side up was overdone and rubbery. On top of that, the use of sauces was not as liberal. Rif and Jeen’s burgers fared better because the egg was wrapped around the patty. I reckon the burger would have tasted better had the cheese slice been wrapped in the egg, along with the patty. Wan placed it below the egg-wrapped patty, making the burger less juicy and a little less satisfying. For those who are greedier than myself, Wan also does a Triple Cheese Special on request, so knock yourselves out! Wan’s Ramly Burger stall is at Mamak Square, Jalan SS2/60, Petaling Jaya. Rounding up the top five is Jackson’s Burger, located near the Digital Mall in Section 14, Petaling Jaya. Operated by a Chinese couple from a van under a tree, this stall offers something that is different from the usual Ramly burgers. According to a source, Jackson gets his patties made by Cold Storage. I ordered the special crab burger that comes with egg and cheese. The crab patty was sandwiched between an egg, a slice of cheese and two pan-fried buns, topped with onion, cucumber slices and a slather of chilli sauce and mayo. The burger was quite good; the sweetness of the patty was complemented by the melting cheese and mayonnaise. Jackson’s burger was the least sloppy, least greasy and smallest in size, but it was good in its own way. I regretted buying only one burger (it was too near dinner time), and very reluctantly let Rif take a few bites. Jackson’s Burger is located along Jalan 14/29 (Jalan Dato Abdul Aziz), Petaling Jaya. It opens from 11am to 5pm (off-days are uncertain).